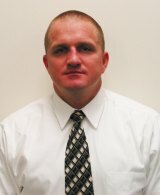 HUNTINGTON, W.Va.… The Huntington District of the U.S. Army Corps of Engineers announces that Jason Barrett has been named Chief of Information Technology (IT) for the Huntington District. As Chief of Information Technology, Barrett is responsible for overseeing all District information technology operations. Activity, Heidelberg, Germany. He also serves as a Signal Officer in the United States Army Reserves. A native of Tyler, Texas, Barrett holds a Bachelors of Science in Information Technology and a Masters in Business Administration. For more information, call the Public Affairs Office at 304-399-5353.